Simply good food! | Wha’ever! Sometimes preparing a nice dinner is so easy. During lunch time one buys some nice chanterelles and some salad. Note: By no means take iceberg salad. Any other salad with more taste will be perfect. Just the tasteless, watery iceberg salad seems like an insult to all other fine ingredients. Back home in the evening one takes a few fresh spices from the own balcony selection. In this case marjoram, thyme, basil and some parsley. One starts with putting some olive oil into a pan and heats it. 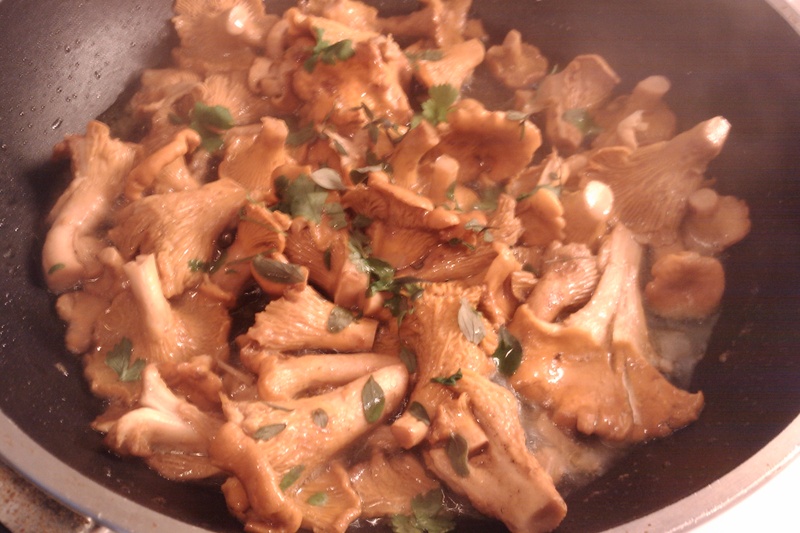 Once hot enough that it almost starts sizzling, one adds the chanterelles. Let them fry a bit, sometimes gently stir them till you see they are shrinking. Then towards the end add all spices and some ground black pepper. When all is looking well enough to be served, take the pan off the fire. Only now add some salt, but not much. The reason for not adding salt immediately is as you might know that all mushrooms suffer during the frying process. Salt destroys their cells and makes them loose all the water inside. And your pan with all that water becomes a flat pot with boiling mushrooms rather than frying ones. The salad one already prepared in a bowl or on a large plate. Now one can simply place the chanterelles on top. There are loads of variations of this one can try. The same recipe works with other types of mushrooms. One can also add some fresh tomatoes, fresh basil leaves and some greek feta. Do not take the one made from cow milk, I am talking proper feta made from sheep milk. Using cow milk feta is like using iceberg salad… . Ah yes. If you think this is not enough for a meal, then add some nice oven fresh garlic baguette. 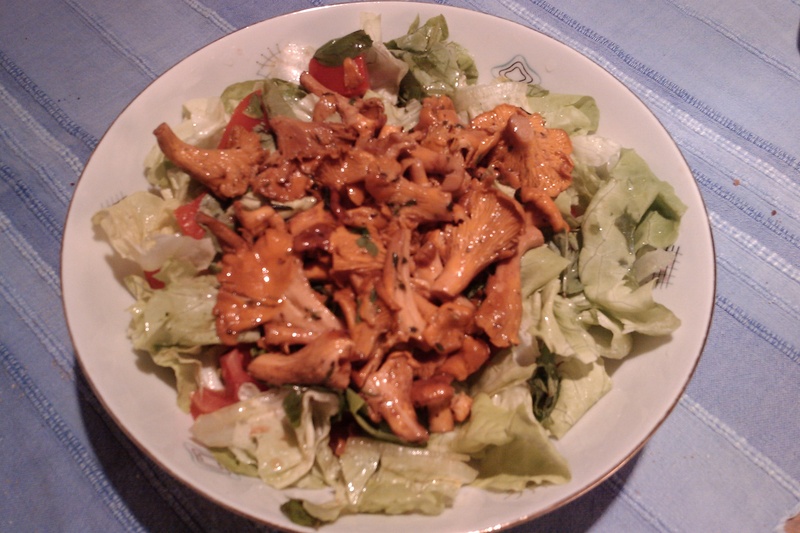 This entry was posted in Current Affairs, Life and tagged food, luxury salad, recipe by anmara. Bookmark the permalink. It looks yummy! Thanks, I’ll try your recipe! Thank you, Elena, really hope you enjoy your own variation of it 🙂 Just checked out your blog, and I think you got yourself a new fan. Great article about Italian Food!